I need help with viruses on my computer. I have Norton installed but I still get viruses. I can't prevent them. In this excerpt from Answercast #89, I look at why anti-virus software always lags behind the malware designers and how you can keep yourself safe on the internet. So... There are a couple of different issues that I want to talk about with this question. One is that there is no single anti-virus or anti-malware product that will absolutely catch every single virus or Trojan or other form of malware that's out there. There just isn't. I have an article on that: "I run anti-virus software. Why do I sometimes still get infected?" The bottom line is that it's ultimately a race. It's a race between the different kinds of anti-malware technologies and the people who write malware. They come up with new techniques; new things to exploit and they push their viruses and malware out quickly, more quickly than software like anti-malware tools can be updated. Imagine... it takes a little bit of time for something as complicated as an anti-malware tool to actually respond to tricky techniques with the complicated algorithms that they need to use to detect viruses - without detecting false positives. So it's a race. Malware is being created every day and anti-malware software is being updated. But it always (almost by definition) lags behind by some amount of time - during which you and I, and everyone else, are vulnerable to these new and increasingly more destructive pieces of malware. So, that's one of the reasons that I always, always so strongly recommend that you make sure your anti-malware software is up to date with the latest version. Make sure that the latest version of that software is configured to get its updates automatically - particularly the updates to the database of malware that they use. That typically will get updated at least once a day and sometimes more often. Make sure that your software is configured to automatically take those updates. So, with that out of the way... "You can't prevent them?" Unfortunately, I strongly disagree. If you're constantly getting malware; if you are constantly getting viruses on your computer, to put it bluntly, you're doing something wrong. Now, something wrong may be as simple as not having a firewall installed or having other technical issues like: not keeping your anti-malware software up to date, and so forth. Do those. But more importantly, nine times out of ten, viruses don't arrive on your computer because they tried to get in, they arrive on your computer because you invited them in. That typically takes one of two forms: either you downloaded and ran an attachment that came via email - or you downloaded a file of some sort and ran it from a site that is (to put it bluntly) less than reputable. So, a lot of malware prevention is, in fact, in your own hands. It's part of your own habits and how you operate your computer on the internet safely. So I'm going to point you at another article. It's actually what I consider to be my most important article - and that is "Internet Safety: Keeping Your Computer Safe on the Internet." It covers not only what I've talked about here: malware, malware tools, keeping things up to date and so forth but also talks a little bit about making sure that you are using the internet in a safe way. That's what I would suggest you start with; that you review those things - and as I say, make sure that your software is being updated and updated regularly. Next from Answercast 89- How do I edit the hosts file in Windows 7? How did I get all these viruses if I have anti-virus software? Anti-malware tools need to be run frequently enough, and be kept updated to keep you safe. I'll look at what to consider when configuring protection. Follow Leo's suggestions. A friend of mine uses and subscribes to Norton and for years would ask me to fix his computer. He finally got smart and contacted Norton support and hasn't called me. Did that work? Personally I ditched anything Norton 7 years ago. Tried 5 other pay AVs and then tried the FREE AVs. Never looked back. Nada, zilch, No problems for 3 years. Just my 2 cents. BTW, Got McAfee as a trial on a laptop free for 6 months 7 years ago and it seemed to work okay. I used Norton for a number of years until I wised up & scanned my PC with several of the freebies which immediately detected a number of unopened, Trojan infected zipped files that my bloated Norton had ignored for many months. Then to my dismay I discovered the infected files were much easier to remove from my system than the self inflicted Norton virus itself! Not to herald Norton Internet Security package, but it's been the best thing I've ever had. And Customer Support is now one of the best. I call and get a tech. Three times in the past two years I had a problem and blamed a virus. I sent msg and they remotely accessed my machine and fixed registry problems that were not even a virus. I had mistakenly installed a home page hijacker. In two of those cases, a Norton supervisor called me days later to ask if the problem was solved to my satisfaction. In my 30 years of computers, no supplied has ever called to ensure things were fixed. Self inflicted viruses are not uncommon, but lately most of the clean up I've been doing for customers has been "drive by" installs. A recent example: the PC of an office admin for a manufacturers representative was infected by the order entry site she uses every day to do her work. The malware creators injected invisible code onto an innocent site, and that code silently and automatically infected viewers of the site. No action needed by the viewer, and nothing visible to alert that there was a problem. Her PC was fully patched, and had up to date anti virus. I could not tell her any way to avoid a similar future scenario. This kind of story is now the majority of what I deal with. As a follow-up on Jim Murphy's comment, I do computer repair and cleanup and like Jim's customer, I'm getting a lot of infected coomputers coming in from drive-by infections. One was from a state run job application site. No warning, no install prompt, just "Boom" and it's infected. That is the majority of the cleanups I do now. I'd estimate half of the cleanups are from 'invitation' and the other half are from drive-by. There was also that worm back in the mid 2000's where all you had to do was connect to the internet and you were infected. So, while Leo's advice is sound and solid, he is doing his readers a disservice by saying one can be virus free by being careful where you go on the 'Net or that one invited these viruses. I still believe that many viruses are "manufactured" by anti virus sellers. Who else makes profit out of a virus? Much, if not most, malware is designed to make money through various means such as stealing passwords and bank account information, and turning computers into spam sending robots. It is highly unlikely that companies such as Norton would have to create viruses to stay in business. 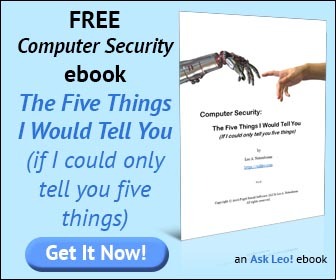 However there are some rogue antivirus programs that infect your computer with malware which holds your computer hostage in order to get you to buy their unlocking program.